The Giants scored at least four runs in all six games on this road trip. That’s something they did in just 39.5 percent of their games last season. 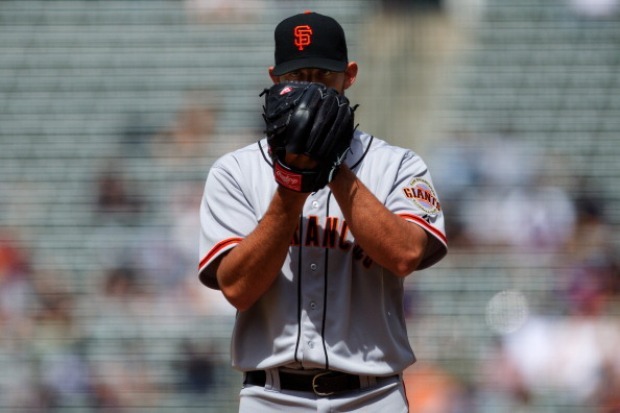 A season ago, 22-year-old Madison Bumgarner didn’t get his first victory until May 19. Jamie Moyer, 49, was trying to become the oldest pitcher in history to win a major league game. Bumgarner is the young. But not the restless. The left-hander no-hit the Colorado Rockies into the sixth inning, the Giants pieced together enough against Moyer and Brian Wilson infused more torture -- plus a visit to the mound from trainer Dave Groeschner -- into his first save chance as the Giants claimed a 4-2 victory on a windy Thursday afternoon at Coors Field.